Hey, Mrs. Library Lady! : Celebrate Libraries [and librarians]! My friends often joke that I'm a "libaraian", as if I walk around in my spectacles hushing them all the time. Yet, they really know that today's librarians (and school media specialists) don't just stand around and check out books. Today's librarians wear many hats: reading specialist, technology guru, research genius, etc. 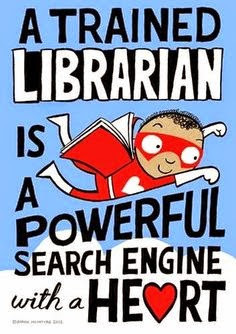 Given that it's National Library Week, let's all take a few minutes and celebrate libraries and librarians for what they are in today's Internet savvy world.